Surprisingly hefty snake bracelets traced to Romanian region, circa 100 B.C. Leaves and snake heads adorn a Dacian bracelet in the Romanian National History Museum . Ancient Transylvanians likely controlled untold riches in gold, suggests a new study of a cache of priceless, snake-shaped bracelets. 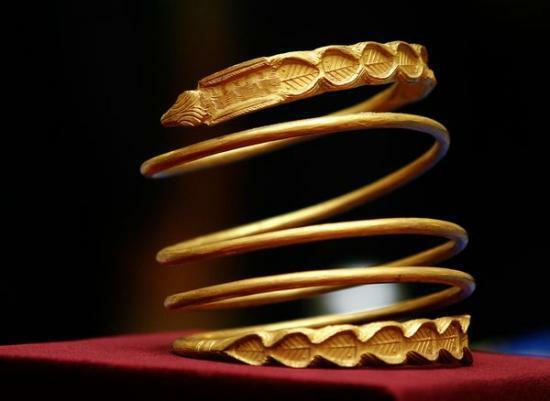 Showing "no economy of gold at all," craftsmen shaped each spiral cuff from an entire ingot, study author Bogdan Constantinescu said. Most of the 2,000-year-old accessories tip the scales at about 2.2 pounds (1 kilogram) each, more than some laptops—a heft that materials scientist Paul Craddock found "surprising." "Yes," Craddock concluded, "they did have a lot of gold." "They" are the Dacian people, mysterious contemporaries of the ancient Romans. Ruling Transylvania centuries before Bram Stoker dreamed up Dracula, the Dacians left behind no writings but, the bracelets suggest, were apparently flush with treasure—as historians have long suspected, given the mineral wealth of the region's mountains and rivers. Looters unearthed some two dozen of the bracelets—12 have now been recovered by authorities—about ten years ago at the Sarmizegetusa Regia archaeological site in Romania's Transylvania region. Perhaps hoping to avoid stiff penalties for archaeological plunder, the men claimed that a now dead comrade had made the bracelets out of melted-down ancient Greek coins—leading many experts to doubt the cuffs' authenticity. Furthermore, the bracelets were found to be at least 2,000 years old. Among the evidence of their age are dark blotches indicative of many years underground, researchers say. Also, the bracelets were found with coins produced between roughly 100 B.C. and 70 B.C., which suggests the cuffs were buried—if not necessarily created—during that time frame. The bracelets seem to hail from the right place as well as the right time, according to study author Constantinescu, a physicist with the Horia Hulubei National Institute of Physics and Nuclear Engineering in Bucharest. Their chemical signature matches that of Transylvanian gold, and Constantinescu suspects the gold for the bracelets likely came from two rivers near Sarmizetusa Regia. Now reduced to faint traces of fortifications and shrines, Sarmizetusa Regia was the Dacian religious and political capital in the last couple centuries of the culture's heyday, which lasted from about 500 B.C. to A.D. 100, when Rome conquered Dacia. Though occasionally unified as a confederation, the Dacians were usually a loose collection of tribes. Mainly farmers and shepherds, the culture also included international traders, potters, and iron smelters, archaeological finds suggest. But since the Dacians lacked a written language, we may never understand the extent of their accomplishments. Much of what's known about them, after all, was written by their Roman conquerors—"not necessarily a good source," said Ernest Latham, who teaches about Romania at the U.S. Foreign Service Institute in Arlington, Virginia. For God or Country—Or Cash? Starved of information about the Dacians, researchers are mining the bracelets for meaning. What were they for? One thing they weren't for is day-to-day adornment, Constaninescu said—the cuffs show no sign of wear. He suspects they may have been offerings to the Dacians' only god, Zalmoxis. This, he said, may explain why the hoard rested undisturbed for thousands of years—just outside the walls of a major Dacian center, no less. "Probably there was divine punishment, damnation, for anyone who tried to take pieces" of the treasure, he speculated. "Gold belonged to the god." Religious use "is a very good guess," said archaeologist Otis Crandell, of Babes-Bolyai University in Cluj-Napoca, Romania. Crandell, who wasn't part of the study, thinks the bracelets may have been hoarded for trade or intended for distribution as tokens of royal favor. He admitted, though, that it's all guesswork "until we find them in context"—that is, until archaeologists can reunite the bracelets and their accompanying artifacts in the exact spot where they were unearthed. But the possibility of complete context may have vanished between 1999 and 2001, when the looters unearthed the bracelets—some in a chest hidden under a large slab of rock—and began selling them illegally. To this day 12 of the looted bracelets remain missing. The other 12 are housed at the Romanian National History Museum in Bucharest. Because of the murk surrounding the hoard's discovery, it may never be authenticated to scientists' full satisfaction. For example, Craddock, formerly of the British Museum, said forgers could have cooked up an alloy simulating Transylvanian gold, then aged the bracelets in acid. Even study author Constantinescu said he can't completely rule out the possibility that the bracelets were made in modern times. But he said it would've been in no one's financial interest to forge so many similar objects. "The price would drop if you have 20 practically identical items," he said. "It would be crazy." Whatever their provenance, the bracelets are enough to wow even seasoned researchers. It's amazing "that a single object would have that much gold in it," Crandell said. "And the fact that there wasn't just one but 12—I was impressed."